Whether you’re looking for a Green Bedding System, Composted Bedding System or a Sand Separation System, Foxland Harvestore has the design and implementation capabilities you need. Starting at the cow, manure must be conveyed from the cow, to a treatment process, to storage, then ultimately applied to the fields. All this must be accomplished while minimizing labor requirements and capital expenditures, as well as eliminating negative environmental impacts. Sand bedding greatly complicates manure system design due to the abrasiveness of sand, as well as the tendency of sand grains to settle in pipes and manure storages. McLanahan Agricultural Engineers specialize in manure system design where sand bedding is used. Who would use Mclanahan Manure System Design Services? Scraped manure, or dewatered flush manure, is fed directly into an EYS Separator specially designed by DariTech to provide the ideal feedstock for theBeddingMaster, which is made up of manure solids at 32% dry matter. The separated solids are fed into the BeddingMaster by passing through the fixed opening in the entry end. DariTech’s stationary ends that do not rotate with the drum increase throughput by over 50%, resulting in more bedding for less money. This is an idea we can all get behind. The beauty of composting manure solids is that the aerobic bacteria which consume the organic matter are already in the solids, courtesy of the dairies’ cows. Once inside the BeddingMaster, the bugs proliferate as they finish the job begun in the cows’ stomachs. A blower pulls air through the drum, ensuring an ample air supply, which mixes with the solids that are tumbling from the rotation of the drum. Within just a few hours, the activity of the bacteria has brought the temperature to over 150°F where it stays as the material moves through the drum like a plug. 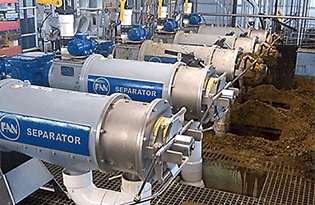 Over five years ago, in response to the dairy industry’s demand for a reliable, self cleaning manure separator at a reasonable price, DariTech developed the concept of an internally fed rotary screen with an external spray bar. Now, we are pleased and proud to introduce the DT360, the new rotary style manure separator. The DT360 has many features which are attractive to dairymen as they balance performance, reliability and labor and maintenance costs with the manure handling challenges facing today’s dairies. Because your time, as well as your crew’s, are best spent on tasks which make the dairy more productive, time spent maintaining and cleaning screens is preferably minimized. The automated spray bar, that can be configured for any timing sequence, allows for ongoing cleaning of the screens with minimal labor required. The 360’s belt driven screen is simply the superior system on the market. Coupled with idler wheels with sealed stainless bearings, the DT360 promises extended periods of maintenance free operation, with infrequent belt changes being simple and inexpensive to perform. Gearbox made in the U.S. In a typical manure scraping system, manure is scraped into a reception pit– in some cases it must be “turned” into the reception pit. This approach is labor-intensive. A barn cleaner may be used to turn manure. However barn cleaners are highly susceptible to wear – especially where sand bedding is used. Gravity flow channels are also used to turn manure. However, debris can settle out in the channel, requiring the channel to be scraped clean regularly. These channels are often large enough to drive a skid-loader into to allow for cleaning. This creates an extremely dangerous working condition if the pit is below the barn floor. The McLanahan Horizontal Auger eliminates ALL of these problems! In tractor scrape systems, the “turning” of the manure into the reception pit is handled by the auger. In mechanical scraping systems, the horizontal auger takes place of barn cleaners. 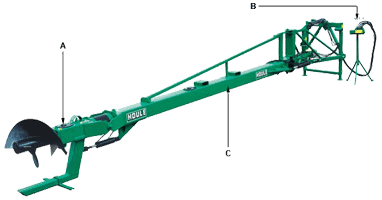 Since the auger does not contact the concrete gutter, wear on moving parts is minimal. To protect man and animal from the rotating auger, as well as to allow vehicle traffic over the auger gutter, solid plate covers are available. 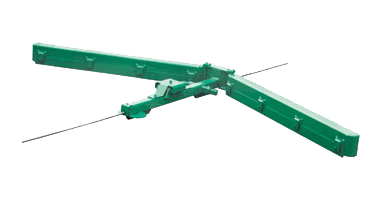 The auger is installed in a concrete gutter, supported by hanger bearings. 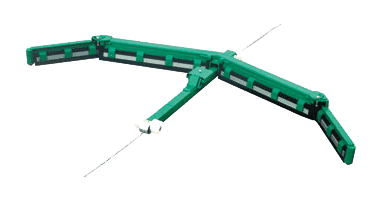 Special mounting options are available to retro-fit augers to existing gutters. At the discharge end, a steel trough supports the motor and gear reducer. As the auger rotates, the conveyed manure forms a natural trough the entire width of the barn. Automated controls are available to interface with alley scrapers. These controls turn the auger prior to alley scraper dumping and off just after the auger trough is empty. 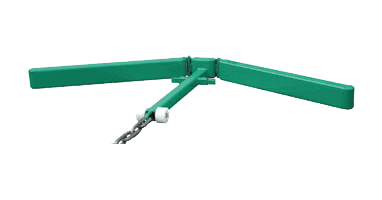 Safety switches are available that discharge the auger when protective gates are open. McLanahan Horizontal augers are available in continuous lengths up to 144 feet. 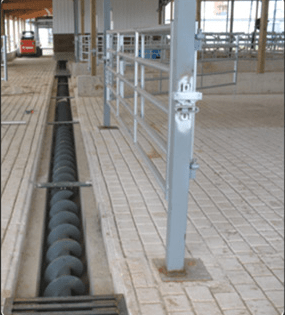 For longer lengths, augers can be “piggy-backed” to achieve any desired flow path from barn to pit. Both single and three phase electric motors are available. In applications where the auger discharge point is below the maximum level of manure, a special submersible gear reducer is available that will keep sand and other harsh contaminants from damaging the reducer. Agitator with large screw for faster agitation without splash and with less odors. Different models of propeller available to agitate up to 33,500 US GPM. A. Heavy-duty propeller with bearings in oil bath protected by a greasable 3-seal mechanism. B. Portable fingertip hydraulic controls. Solenoid valves available to operate 2 pump functions per each tractor hydraulic port. C. 540 RPM heavy-duty driveline with #55 PTO. Standard on 3-point hitch to break crust from underneath. When directed downwards, the propeller strongly pulls chunks to accelerate agitation. Articulation of driveline in oil bath. Crust breaking position from underneath, used at the beginning of the agitation. Agitating position, used to create a swirl in the reservoir and to clear the immediate surrounding of the propeller. Mixing position, used to draw the solid into the propeller. 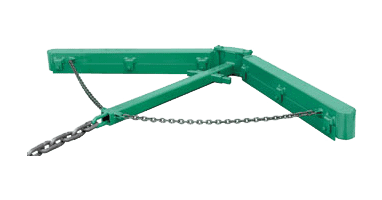 Available on 3-point hitch to agitate a wider area without having to move the tractor. Available for road traveling. Heavy-duty jack to line-up the tow bar with the draw bar of the tractor. Quick installation with rods and pins. Selection of scrapers for alleys on concrete or rubber mat, with or without groove for chain. 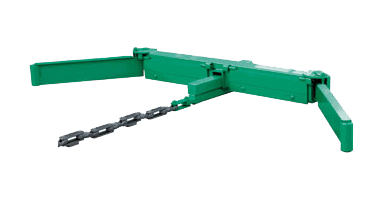 Three basic models of scrapers are offered for 7/8″ and pintle chains: 16° scraper, straight scraper and V-shape scraper. The chain groove ensures the scraper remains centered widthwise and keeps the chain below the floor in order to maintain cow comfort. Adjustable folding ends are available on 16° scraper in order to keep the scrapers centered in alleys without groove. 16° TILTING SCRAPER WITH REPLACEABLE STEEL BLADES AND FOLDING ENDS – Adjustable flexible blades available for alleys with rubber mat and to better clean concrete alleys. Tilting blades start to clean the alley at the very beginning of the stroke and draw less bedding on the back stroke. Shown with optional center hinge. 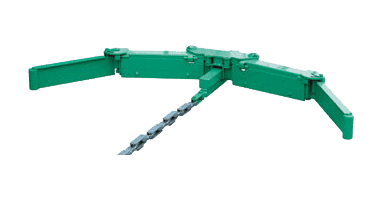 16° TILTING SCRAPER – With steel wear blades and standard folding ends for manure alleys with or without groove. Tilting blades start to clean the alley at the very beginning of the stroke and draw less bedding on the back stroke. 16° TILTING SCRAPER WITH ADJUSTABLE FLEXIBLE BLADES – For rubber mat and to better clean concrete alleys. Draw bar for groove available. OPTIONAL ADJUSTABLE FOLDING END – The 16° scraper is available with folding ends adjustable widthwise to keep the scraper centered in a manure alley without groove. The width of the alley must be even. 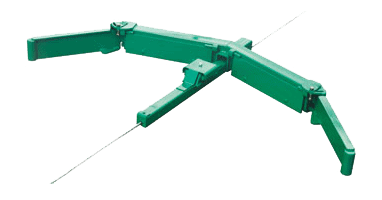 OPTIONAL HINGES – On 16° scraper to fold arms towards the center of alley. To allow circulation for bedding purpose. STRAIGHT SCRAPER WITH REPLACEABLE STEEL BLADES. Adjustable flexible blades available for alleys with rubber mat and to better clean alleys on concrete. Installation in a groove only. V-SHAPE SCRAPER WITH REPLACEABLE STEEL BLADES. – Steel blades can be adjusted in order to compensate for wear. V-SHAPE SCRAPER WITH NYLON ROLLERS – V-Shape with low-friction nylon rollers and round edges for use in alleys with rubber mat. Steel blades can be adjusted in order to compensate wear. Model with low-friction nylon rollers and round edges also available for use in alleys with rubber mat. Shown with draw bar running in a groove. The Fan Press Screw Separator (PSS) is an excellent machine made for the separation of suspended solids from liquids and sludges. With its compact design, it is easy to install and simple to maintain. Depending on the application, capacities between 5 and 350 cubic meters can be achieved.